By Mary Hope Kramer Starting an animal rescue or shelter requires proper planning, facility preparation, and dedicated fundraising efforts. Nigel has been rescuing Animals for the past 23 years. His career started off at the RSPCA as an Ambulance driver and after 12 months a position was created for him as a Animal rescue officer within the inspectors office. When his position was made redundant after 5 years, Nigel decided to start his own animal rescue business. Nigel’s Animal Rescue began 1989 and Nigel is now the only person in Victoria with the skills and expertise to deal with any animal rescue, no job to big or to small, in fact Nigel has performed over 30,000 rescues since 1985. PetRescue is a growing national movement inspiring Australians to discover the joy and unconditional love a rescue pet brings. We believe there is a home for every rescue pet and enough love to save every life. Driven by this belief, we created the PetRescue website and embraced social media to give homeless pets a voice and make adoption the first choice for all. It is our duty to these amazing creatures to do what is right, after all we as humans have taken their birth right to be free and have unintentionally, naively and with devotion in our hearts- caused them pain”. There is a major increase in the trend to own a parrot in Australia, as there seems to be a perceived view that a bird is an easy low maintenance companion pet. The increase in demand of pet parrots is slowly flooding the market with unwanted pet parrots, as the associated care with owning a parrot can greatly out way that of owning a dog or cat. This is no longer one person or even one industry’s fault, but is a result of many of us forgetting that we remain responsible forever for what we have tamed. Societies view of animals needs to change and there existence must no longer be based on “owning or dominating animals” or having animals as commodities, but must be about living together as one and giving these animals the respect and kindness they deserve by providing them a voice rather that a prison sentence. 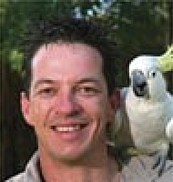 The hundreds of inquiries received yearly regarding our programs demonstrate that there is an overwhelming need to provide continuing education and information to the public, the veterinary community and the Avicultural industry about the physical, psychological, social, environmental, medical and nutritional needs necessary to provide for the total well being of these highly intelligent, long-lived creatures “parrots”. This statement is why the Parrot Rescue Centre now exists. We want to help provide the education for people and the support for the parrots that have lived a jailed life for so many years. Dedicated parrot enthusiasts Zarita Garozzo and Jamie Carpenter are the founders of the Parrot Rescue Centre. After many years of developing a deep level of understanding about the feeding, nutrition, housing and behaviour training of parrots, Zarita and Jamie decided to focus on using their acquired knowledge to improve the lives of parrots in need of dedicated care in Australia. They have sought to achieve this by providing an environment that caters for the individual needs of the parrots they take in. Halfway Home Animal Rescue Inc. is a foster program and registered charitable organisation. We are not a shelter so do not have a centralised location. All adoptions take place via an adoption application. We match people to animals. We are an all-breed dog and cat rescue staffed by volunteers and entirely funded by public donations that go straight into helping animals in our care. We rely upon a network of volunteer foster homes that care for the rescue animals while a forever home is being found. All animals that we take in are vaccinated, desexed, micro-chipped, wormed and groomed before being rehomed. NMDR’s mission is to RESCUE, REHABILITATE and RE-HOME discarded breeding dogs and to educate the general public about the cruel realities of the commercial dog breeding industry. Our advertisers offer Dogs, Cats, Horses, Ponies, Rabbits, Hamsters, Snakes, Birds, even Iguana’s and many other pets all needing new loving homes in the UK. BUKpets.co.uk established since 2004. Designed to advertise your Pets for Sale as well as Services and Products related to pets and animals in the UK. Also, Animal Charities and Pet Rescue Centres in your area. Hopefully, you will find the pet you are wishing to give a loving new home to and everything you may need for your very special pet. Whether you are looking for a pet or have a pet you wish to find a new loving home for, then we are here to help.